Arthritis is a condition resulting in painful joints. It is extremely common in older pets, especially the larger breeds of dogs. Any joint can be affected with arthritis. The most commonly affected joints include the hips, knees, shoulders, elbows, and vertebral column (back). 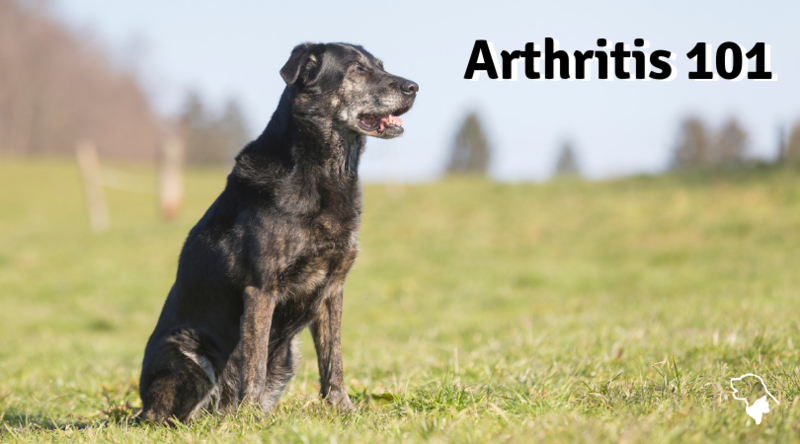 It is estimated that arthritis affects one in five adult dogs—or more than 8 million in the U.S. Arthritis may be a result of an injury or may develop for unknown reasons. Frequently it is progressive (worsens with time) and may develop slowly or quickly. Often it begins with occasional sore days, often associated with weather changes or strenuous exercise. Clinical signs in most pets are often worse when they first get up and start to move. Overweight pets are most susceptible. Many clinical signs may be a result of arthritis and the related pain it causes. Signs may include lack of appetite, reluctance to walk, climb stairs, or play, limping, lagging behind on walks, difficulty in rising from a resting position, personality changes, or even crying aloud when the pain is severe. Animals don’t moan or whimper until the pain becomes very severe. Other diseases must be ruled out before a diagnosis of osteoarthritis can be made. Potential rule-outs include disc disease, ligament tears, bone infections, and nerve damage. X-rays are often necessary to obtain the correct diagnosis. There is no need to let your pet suffer the intense pain that can be attributed to arthritis. Strategies for treatment of arthritis may be either proactive or reactive. Proactive involves therapy, which increases the body’s ability to cope with the problem. Such things as drugs to improve and strengthen body mass and drugs to increase the joint fluid (lubrication) within the affected joints are available. Reactive treatment includes such things as drugs designed to minimize pain. Pets do not tolerate human painkillers such as aspirin, ibuprofen, and Tylenol™ as well as people (therefore, do not give these drugs to your pet). Recent advancements in drugs for treating arthritis in pets have greatly enhanced our ability to control the pain of osteoarthritis. One such new drug is Deramaxx. We can work with you to find the best options for you and your pet. Periodic comprehensive physical examinations and laboratory screening is necessary to monitor the body’s response to any long-term medication. Regular, moderate exercise is very important in keeping joints working properly. Over-exertion can make the condition worse. Swimming is great exercise for arthritis pets. The number one cause of malnutrition in pets is Obesity!.Overfeeding, either too much food or food too rich, is the major culprit. Older pets may need no more than 50% of the calories of a young, growing pet. What are allergies, and how do they affect pets? One of the most common conditions affecting dogs and cats are allergies. In the allergic state, the dog's immune system “overreacts” to foreign substances (allergens or antigens) to which it is exposed. These overreactions are manifested in three ways. The most common is itching of the skin, either localized (one area) or generalized (all over). Another manifestation involves the respiratory system and may result in coughing, sneezing, and/or wheezing. Sometimes, there may be an associated nasal or ocular (eye) discharge. The third manifestation involves the digestive system, resulting in vomiting or diarrhea. Are there several types of allergies? There are five known types of allergies in dogs and cats: contact, flea, food, bacterial, and inhalant. Each of these has some common expressions, and each has some unique features. Contact allergy is the least common of the five types of allergy. They result in a local reaction of the skin. Examples of contact allergy include reactions to flea collars or to types of bedding, such as wool. If the pet is allergic to such substances, there will be skin irritation and itching at the points of contact. Removal of the contact irritant solves the problem. However, identifying the allergen can require some detective work. Flea allergy is common in dogs and cats. A normal animal experiences only minor irritation in response to flea bites, often without any itching. On the other hand, the flea allergic animal has a severe, itch-producing reaction when the flea's saliva is deposited in the skin. Just a few bites cause such intense itching that the dog or cat may severely scratch or chew itself, leading to the removal of large amounts of hair. There will often be open sores or scabs on the skin, allowing a secondary bacterial infection to begin. The area most commonly involved is over the rump (just in front of the tail). The most important treatment for flea allergy is to get the animal away from all fleas. Therefore, strict flea control is the backbone of successful treatment. 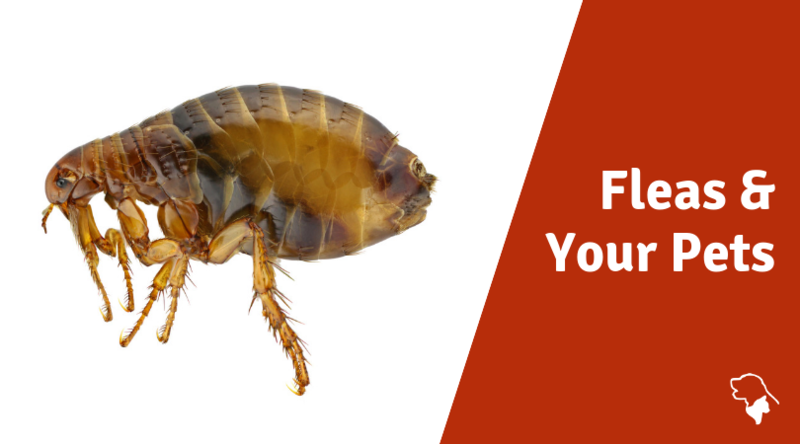 Unfortunately, this is not always possible in warm and humid climates, where a new population of fleas can hatch out every 14-21 days. When strict flea control is not possible, corticosteroids (or "cortisone" or "steroids") can be used to block the allergic reaction and give relief. This is often a necessary part of dealing with flea allergies. If a secondary bacterial infection occurs, appropriate antibiotics must be used. There are many types of Staphylococcus (Staph) bacteria. Some cause severe disease and some do not. There are several species of Staphylococcus bacteria that live on normal dog skin. If the skin is normal and the dog's immune system is normal, Staph causes no problems to its host. However, some dogs develop an allergy to this bacterium. When this happens, the dog develops areas of hair loss that look much like ringworm. They are often round and 1/2 to 2 inches (1-5 cm) in diameter These same lesions develop in true Staph infection; they are easily treated with certain antibiotics, but the Staph-allergic dog has recurrent “Staph infections.” The lesions will usually clear with appropriate antibiotics but return as soon as antibiotics are discontinued. After a while, some dogs become resistant to antibiotic treatment. Treatment of Staph allergy involves antibiotics to control the immediate problem and desensitization with Staph antigen for long-term relief. The most common type of allergy is the inhalant type, or atopy. Dogs may be allergic to all of the same inhaled allergens that affect humans. These include tree pollens (cedar, ash, oak, etc. ), grass pollens (especially Bermuda), weed pollens (ragweed, etc. ), molds, mildew, and the house dust mite. Many of these allergies occur seasonally, such as ragweed, cedar, and grass pollens. However, others are with us all the time, such as molds, mildew, and house dust mites. When humans inhale these allergens, we express the allergy as a respiratory problem; it is sometimes called “hay fever.” The dog's reaction, however, usually produces severe, generalized itching. In fact, the most common cause of itching in the dog is inhalant allergy. Most dogs that have inhalant allergies react to several allergens. If the number is small and they are the seasonal type, itching may last for just a few weeks at a time during one or two periods of the year. 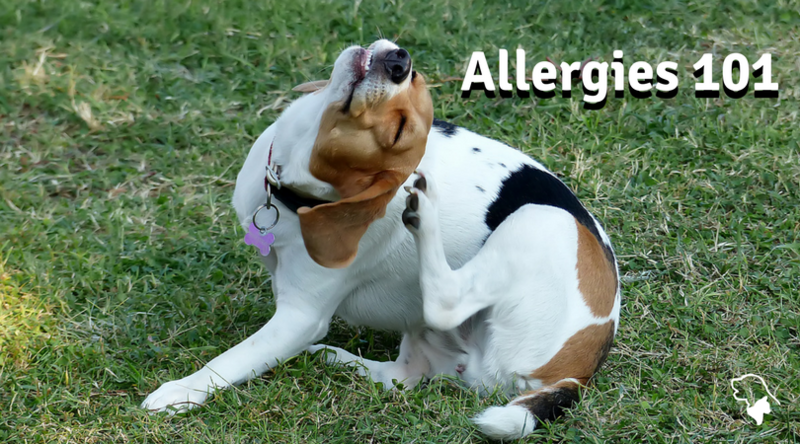 If the number of allergens is large or they are present year-round, the dog may itch constantly. Treatment depends largely on the length of the animal's allergy season. A treatment plan will be developed for you and your pet because every animal responds differently and has different needs. Dogs and cats are not likely to be born with food allergies. More commonly, they develop allergies to food products they have eaten for a long time. The allergy most frequently develops in response to the protein component of the food; for example, beef, pork, chicken, or turkey. Food allergy may produce any of the clinical signs previously discussed, including itching, digestive disorders, and respiratory distress. We recommend testing for food allergy when the clinical signs have been present for several months, when the pet has a poor response to steroids, or when a very young dog itches without other apparent causes of allergy. Testing is done with a special hypoallergenic diet. Because it takes at least eight weeks for all other food products to get out of the ystem, the pet must eat the special diet exclusively for 8-12 weeks (or more). If positive response occurs, you will be instructed on how to proceed. If the diet is not fed exclusively, it will not be a meaningful test. We cannot overemphasize this. If any type of table food, treats or vitamins are given, these must be discontinued during the testing period. We have treats that are hypoallergenic and made for animals with food allergies. There may be problems with certain types of chewable heartworm preventative, as well. We can discuss the options with you. Unfortunately, many times before dental care is provided for pets, dental disease is present. Just as preventive care for your pet is relatively inexpensive, treating dental disease can be significantly more costly. A comparison is if you take good care of your car with regular lube, oil and filter changes, and the cost is minimal compared to having to rebuild the engine or transmission. There is a wide variation in the degree of dental health in pets. Dental disease can be put into four categories: tartar, gingivitis, pyorrhea and periodontitis. Tartar is the accumulation of plaque that has hardened on the teeth, usually starting at the gumline in conjunction with gingivitis. Gingivitis is inflammation of the gums. The gums may be irritated, inflamed or infected. You can easily see this by the increase in the pinkness of your pet's gums, especially at the gumline. The gingiva may have receded, allowing tooth roots to be exposed. Another condition is when the gingiva may have become hyperplastic, a condition where too much tissue has developed in an area. Pyorrhea is very serious. It is pus in the mouth, usually between teeth and gums. This infection is usually causing periodontitis, which is loss of bone that holds the teeth in. Pyorrhea and Periodontitis go hand in hand. These pets may have damage to their heart valves, liver, kidneys and lungs caused by the dental disease. Once a kidney cell is damaged, it will never recover, nor be replaced by the body. We must prevent further damage to the kidneys. These pets are at increased risk, and require special care. We must be more cautious with these pets. We have gone to great expense to insure your pet is well monitored under the safest anesthesia possible. One or more reasons cause dental tartar, gingivitis and/or periodontitis. The first reason is feeding canned or soft foods. These foods give no benefits to the teeth and gums because they require little to no chewing. The second is hairstyles/grooming. Pets that have beards or long hair around their mouth seem to develop dental disease faster than well-trimmed breeds. The hair around the lips catches moisture and bacteria and constantly feed bacteria into the mouth. Lack of grooming, or lack of in-home dental care is a leading condition. The final reason is genetics. As with our teeth - some people get cavities or excessive tartar due to genetics - some animals have more dental problems than others due to genetics. Since we cannot change our genetics, dry food and hard biscuits and daily brushing, preferably with an electric toothbrush, are our recommendations. We have seen significant improvement in dental health with pets fed Hill’s Science Diet t/d (Tartar Control Diet) as treats. Fractured (broken) teeth are another common abnormality seen. Chewing on hard objects can break teeth. Sometimes fractured teeth need to be extracted or referred to a veterinary dentist for repair. Dental health is your choice. Let us help you keep your pet as healthy as possible.